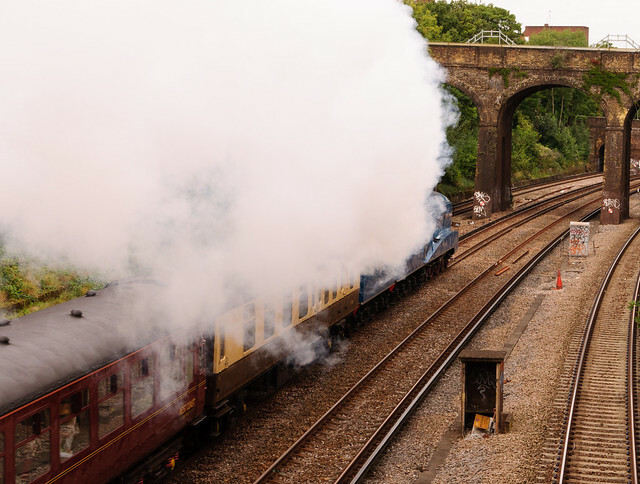 I had to miss last week's Dorset Coast Express to go to a BlackBerry launch, so I wandered along to the footbridge at the end of the street this morning to see what was pulling it out of Victoria, on the way down to the coast and to Weymouth. 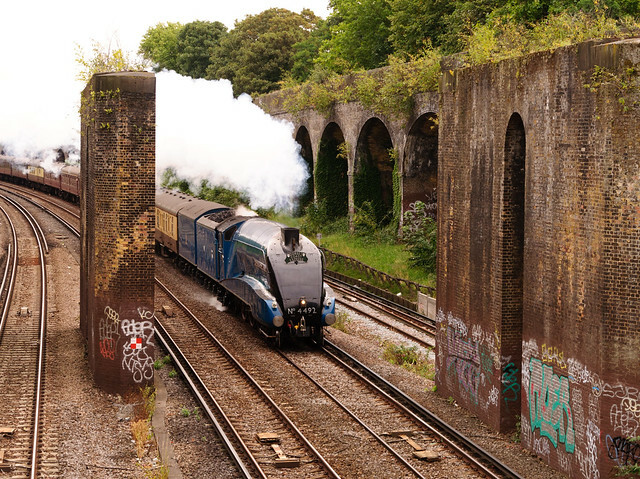 As it cam around the curve from Wandsworth I could see the familiar shape of a Gresley A4, streamlined curves and shining blue paint. 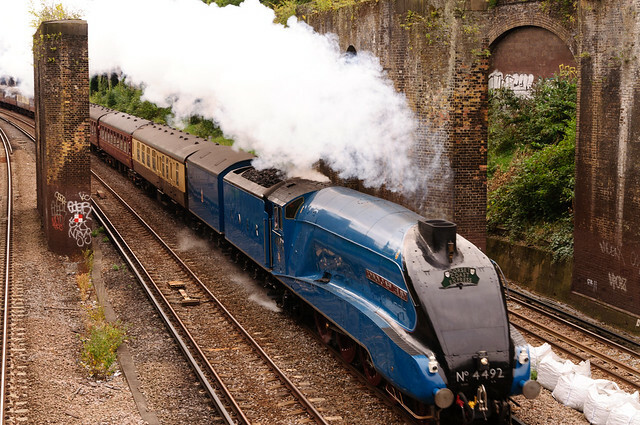 It was Bittern again, in its current guise as Dominion of New Zealand. This time I moved down the bridge a bit, looking to get a different view of the train - and perhaps glimpse its red driving wheels. And there they are! The red wheels! 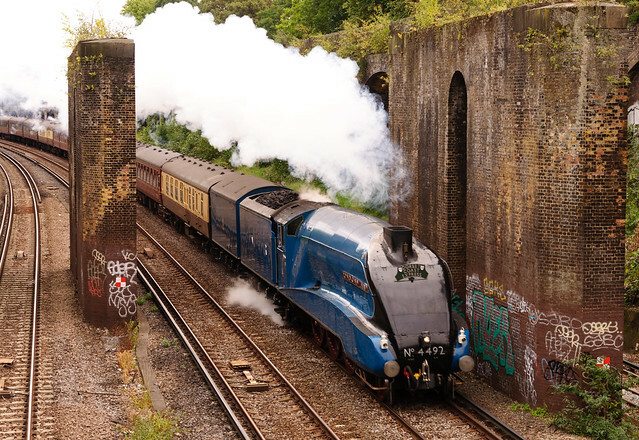 Looking at this picture I think I found a good spot, and a good angle that shows off Bittern's streamlined curves, reflections in its shining blue paint finish. 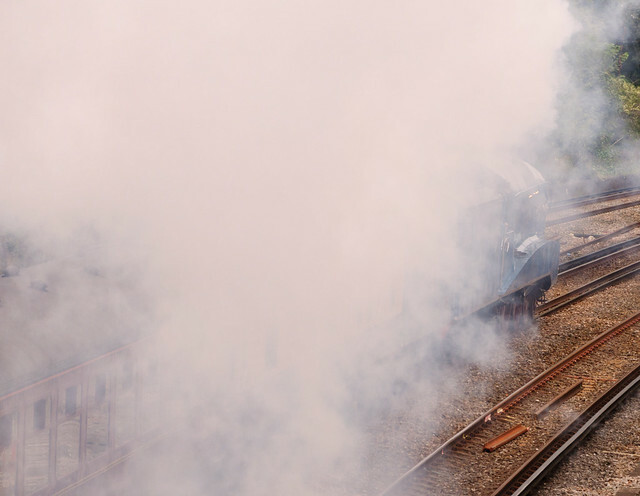 Out from under the footbridge and the locomotive is shrouded by steam and smoke. And then it was gone, off through the station and down to the coast. Somewhere in my head there's a small boy, standing on a bridge watching the trains. Oh, I hadn't realized they'd put the valences back. Any one of these pictures is worth more than ten thousand tweets.